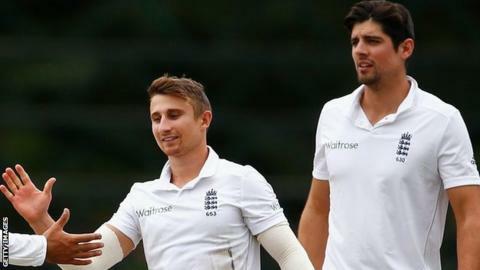 England Test captain Alastair Cook says the retirement of national team-mate James Taylor came as a "huge shock". Nottinghamshire batsman Taylor has been forced to give up the game because of a serious heart condition. Taylor, 26, returned to the England Test side for the first time in three years in October, a move that was welcomed at the time by Cook. "He proved people wrong time and time again and was a great character to have around the dressing room," he said. "It's a career cut very short but, on the flip side, at least it's been detected and we're not talking about something a lot worse." Taylor has been diagnosed with Arrhythmogenic Right Ventricular Cardiomyopathy (ARVC), a condition similar to the one which affected footballer Fabrice Muamba, and needs an operation. He played in seven Tests and 27 one-day internationals, having started his career with Leicestershire. "When I found out on Monday night it was a huge shock, and a realisation of how lucky we are that we are able to play this great game," Cook told BBC Essex. "If there's a guy that can handle what he's going through, it's him because of his character. "Hopefully the operation can go well and we'll see him around, and adding his talent to the English game in a different way." Yorkshire and England wicketkeeper Jonny Bairstow, a former room-mate of Taylor, says cricket's current heart screening process is in place to save lives. "Naturally, something like that is very tough to take and is a bit scary in many ways," said the 26-year-old, who also played cricket and rugby against Taylor at schoolboy level. "Hopefully we can keep doing the checks, as it has been found early enough to save someone's life. "I'm keen on things like that. I've been checked and, touch wood, everything is OK. You can't be 100% certain in life, but as far as I'm concerned the checks and procedures are in place and get taken care of."